Received 6 July 2010; revised 21 August 2010; accepted 24 August 2010.
ing in soybean cultivars along the main stem. seed composition constituents in breeding lines. nutrition and a source of soybean meal for livestock feed. tein and oil content (seed composition). middle third of plants (392 g kg-1). seed is required for seed composition [8,9] and S .
at R5, 6.35% at R6, and 6.68% at R7 . 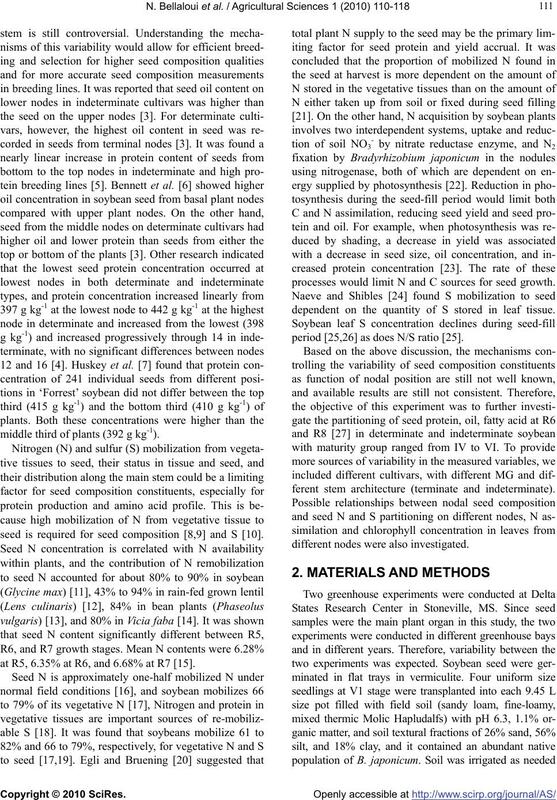 processes would limit N and C sources for seed growth. dependent on the quantity of S stored in leaf tissue. period [25,26] as does N/S ratio . ferent stem architecture (terminate and indeterminate). different nodes were also investigated. Hutcheson, determinate; MG VI TracyM, determinate. S) to investigate the distribution pattern. (Bottom). The number of nodes ranged from 10 to 15.
pods on the main stem had been fully matured. (0, 60, 120, 180, and 300 min) for nitrite determination. oleic and linolenic acids, N, and S) (data not shown). Bottom = B) and cultivar at R6 (seed-fill stage) and R8 (physiological maturity stage). 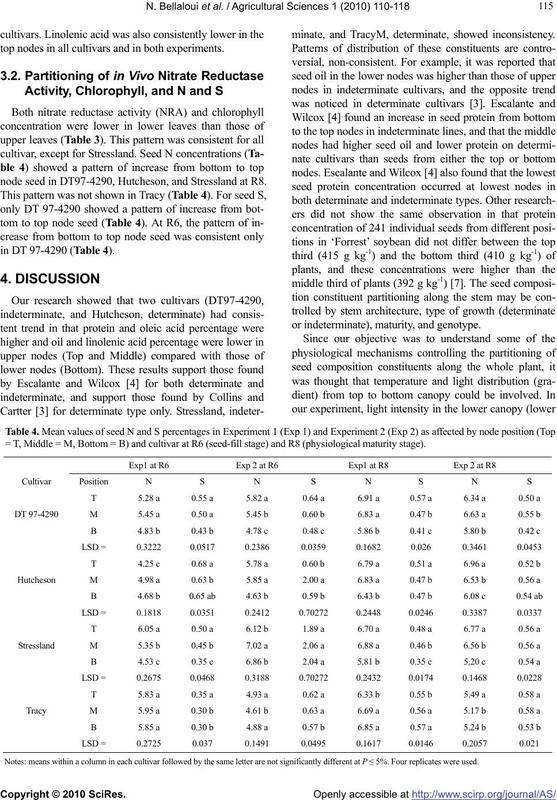 Notes: means within a column in each cultivar followed by the same letter are not significantly different at P ≤ 5%. Four replicates were used. top nodes in all cultivars and in both experiments. node seed in DT97-4290, Hutcheson, and Stressland at R8. in DT 97-4290 (Table 4). minate, and TracyM, determinate, showed inconsistency. or indeterminate), maturity, and genotype. = T, Middle = M, Bottom = B) and cultivar at R6 (seed-fill stage) and R8 (physiological maturity stage). more limited seed oil accrual under shade conditions. 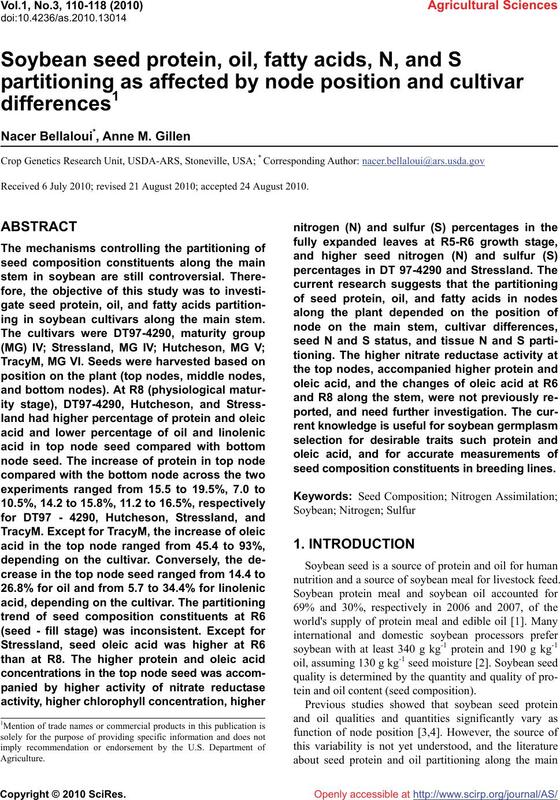 effects on seed size, protein, and oil . (increase of 35% comparing to the upper node leaves). tionships between these factors and seed composition. along the main stem, but further research is needed. 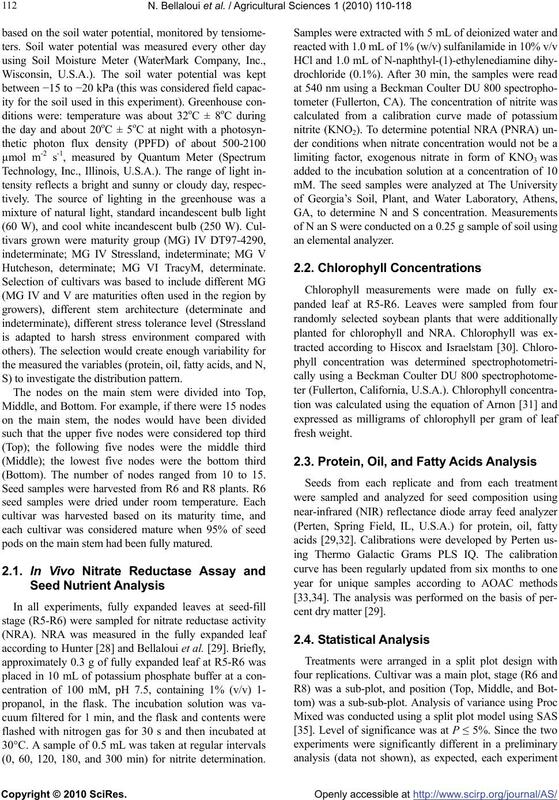 Research Service, project number is 6402-21000-034-000.
the soybean plant. 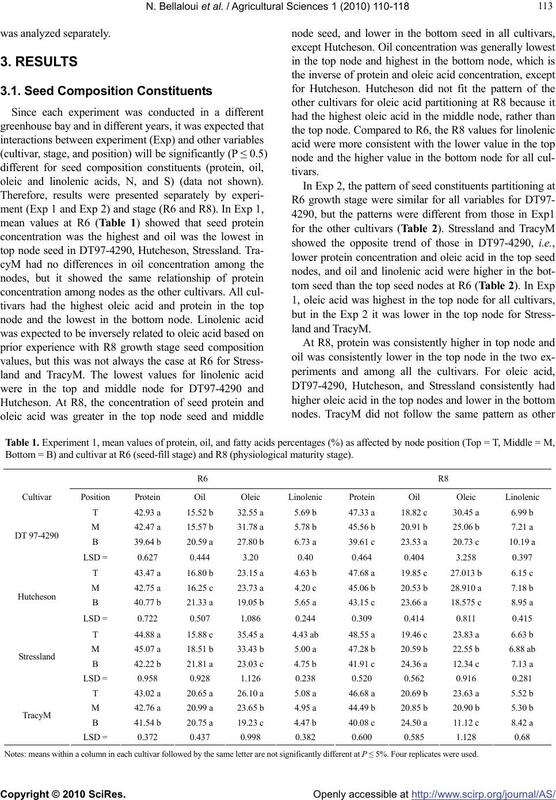 Agronomy Journal, 48, 216-219.
bean genotypes. Crop Science, 33, 1164-1166.
soybean near-isolines. Crop Science, 33, 1166-1168.
culture and Food Chemistry, 51, 6882-6886.
the American Oil Chemists’ Society, 67(10), 165-167.
bean. Plant Production Science, 1, 3-7.
plants. Crop Science, 25, 225-229.
under field conditions. 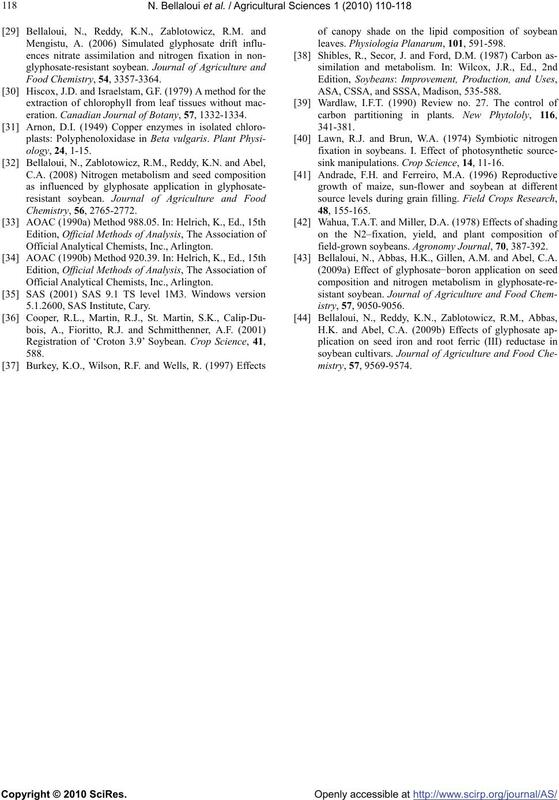 Field Crops Reserach, 8, 93-104.
of the American Oil Chemists’ Society, 81(1), 77-81. P, and K by soybean (Glycine max (L.) Merrill) plants. Society of Plant Physiology, Rockville, Maryland. Loberg, G.L., Shibles, R., Green, D.E. and Hanway, J.J.
types. 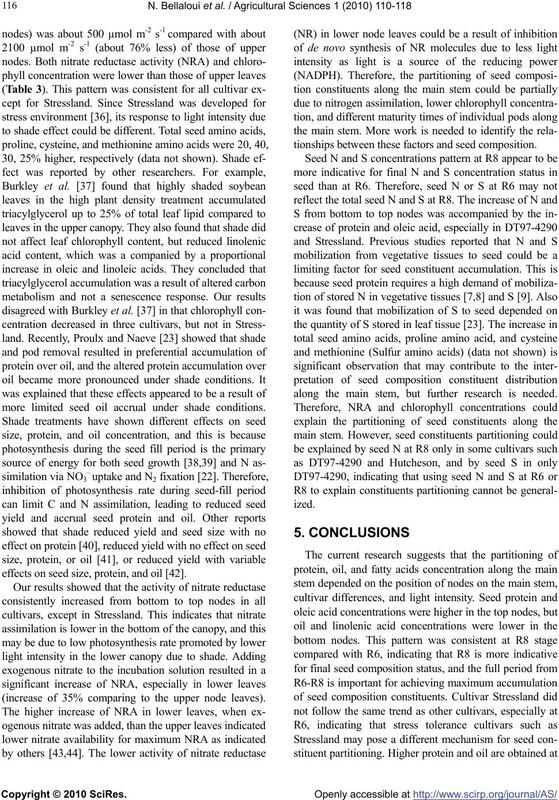 Journal of Plant Nutrition, 7, 1311-1327.
in Soybean. Agronomy Journal, 75, 1027-1031. Harper, J.E. (1987) Nitrogen metabolism. In: Wilcox, J.
and Uses, ASA, CSSA, and SSSA, Madison, pp. and defoliation effects on soybean yield, protein, and oil. available sulfur. 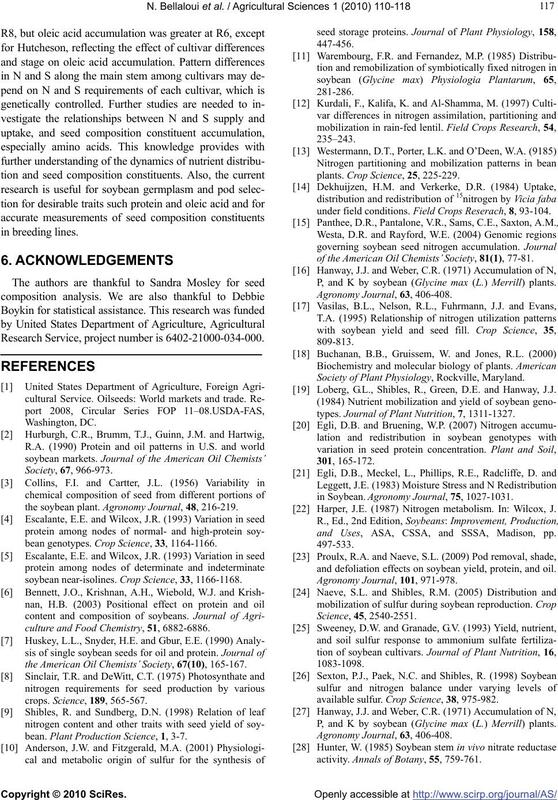 Crop Science, 38, 975-982.
activity. Annals of Botany, 55, 759-761.
eration. Canadian Journal of Botany, 57, 1332-1334. Official Analytical Chemists, Inc., Arlington. leaves. Physiologia Planarum, 101, 591-598. ASA, CSSA, and SSSA, Madison, 535-588.
sink manipulations. Crop Science, 14, 11-16.
field-grown soybeans. Agronomy Journal, 70, 387-392. Bellaloui, N., Abbas, H.K., Gillen, A.M. and Abel, C.A.